The headline of that day's paper and the photograph of Donna Sebastian standing amid the rubble of her northern Kentucky home belie the scope of destruction caused by a string of deadly tornadoes that traveled along a path between Louisville and Cincinnati across three states on Friday. 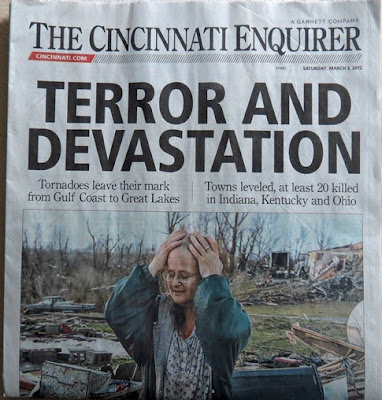 Five pages of the paper's main section were dedicated to covering the "Day of Destruction", to include maps, photographs and contact information to allow readers to help the victims of this natural tragedy. As of this posting, 39 people have been confirmed dead--including a family of five where a 15-month old girl initially survived but succumbed to injuries sustained from being dropped from a funnel cloud into a field near her family's home in Salem, Indiana. Today, the entire family was buried in two caskets--the mother with her two daughters in one and the father and young son in the other. I know I will come across another copy of the Enquirer in the future and do my usual overview of their product and operations as I've done with other publications here. Right now, with the grief and destruction still so fresh in many people's minds, I'm just not in the mood.